Did you know WordPress is one of the most popular website-building tools on the internet? Not only is it incredibly easy to design a fantastic digital presence via WordPress, but the platform also offers a host of themes and plugins developed to make your website more attractive too. While there are many things to love about WordPress, the idea we’re going to focus on today is what makes your website look incredible – theme frameworks. Theme frameworks for WordPress are code libraries that form the basis of your theme. From that library, you can build out and customize your website to suit your needs. So, which are the best theme frameworks for 2019? Created by the StudioPress team, Genesis is one of the best-known theme frameworks for WordPress. It powers some of the most famous themes in the digital world and offers a clean and easy-to-use code that makes updating your site easy. StudioPress delivers a fantastic experience from start to finish with Genesis. You’ll find a high-level of security built into the framework for peace of mind. There are also regular updates, so you can ensure that criminals aren’t able to make their way into your system. Genesis also offers a wide range of customization options for footers, headers, widgets and more. Perhaps best of all, Genesis is compatible with Envira too – for all of your gallery-building needs. Gantry is an impressive WordPress theme framework delivered by the experts at Rocket Theme. This well-known development agency makes developing your image easier, regardless of whether you’re on WordPress, Joomla, or a completely different system. With a visual menu editor and powerful layout manager to enjoy, Gantry is excellent for beginners in the development world. Even if you don’t know a lot about coding, you’ll learn how to build amazing themes in less time than you’d think. Additionally, there are 38 different design layouts to choose from to get you started. Gantry is attractive, easy to use, and it’s compatible with a number of fantastic WordPress plugins. If you’ve found yourself searching for pre-made WordPress themes that are compatible with Envira before, you’ve probably come across the Elegant Themes website. Spend a little time exploring, and you’ll find Divi, one of the best-known theme frameworks for WordPress. Like many of the best libraries available today, this framework comes with an impressive drag-and-drop builder, and a wide selection of pre-built templates to choose from. Additionally, the features of Divi mean that it’s great to use with a host of website projects. Even if you only want to make some basic customizations to your site, Divi could be the solution. Divi is compatible with Envira, and it also comes with the opportunity to join the Elegant Themes club, for access to various high-quality themes and plugins. WPZoom is a simple but effective WordPress Framework created by a team of expert developers. The company created this framework to power their commercial WordPress templates. The idea is that when you choose one of the immersive WPZoom themes, you’ll be able to find all the coding and functionality of the framework layered underneath. Switching from one theme to another is incredibly easy with WPZoom, which is excellent if you’re looking for a way to refresh your image every once in a while. However, we recommend not changing things up too often, or you could end up confusing your audience. The good news is that whatever theme you choose with WPZoom, you can rest assured that your site will be built on strong and reliable foundations. The user-friendly control panel is a bonus too! 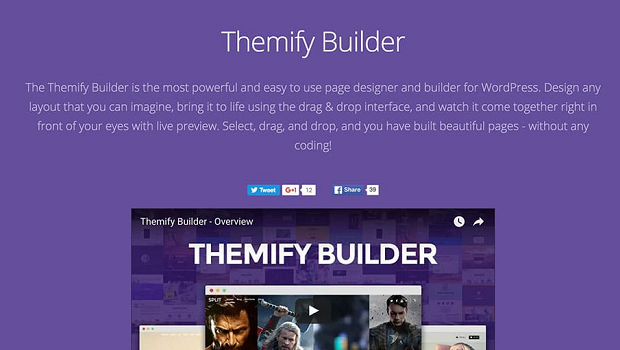 Finally, the last option on our list of theme frameworks for WordPress is Themify. The thing that makes this theme developing tool so impressive is the fact that you don’t need to know much about coding to start using it. Many elements of your page can be dragged and dropped into place, including galleries, maps, tabs, sliders, and a lot more. There’s also the option to add numerous widgets to your page layouts – including the widgets connected to plugins that you already have installed on WordPress. More than 90,000 customers currently rely on Themify to design stunning WordPress websites, with responsive imagery and excellent usability. The package even comes with themes to suit different industries. What do you think about our favorite theme frameworks for WordPress? Let us know in the comments, and remember to check us out on Facebook and Twitter.